They say, "It is not the gift, but the thought that counts," and we at Printcious are more than happy to provide you the perfect platform to showcase your innermost genuine feelings through our assorted range of gift items. 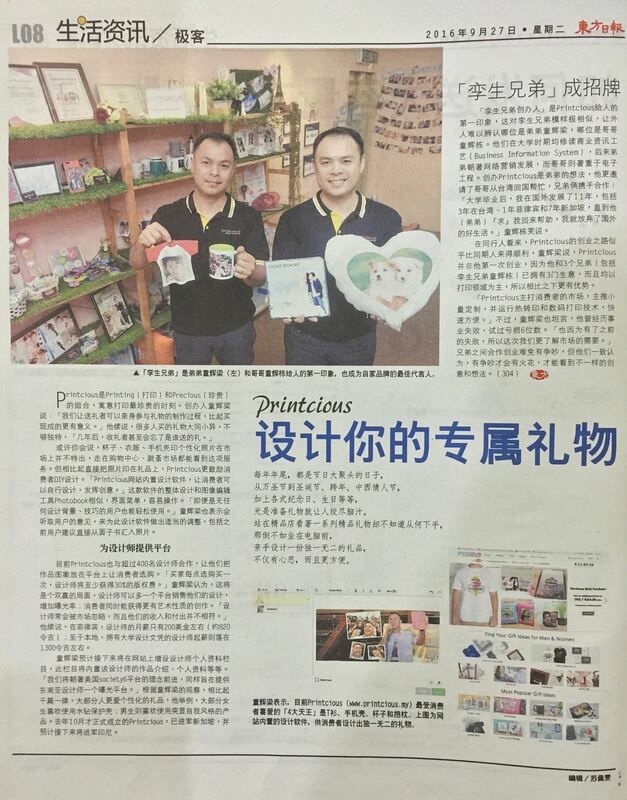 Be it mugs, t-shirts or striking rectangular puzzles, Printcious is equipped with premium giveaways which are perfect for everyone who lives in Malaysia. In fact, you can also check out our gifts for him and get the best gifts for her too. Are you looking for that spunky and unique gift for your special person, which you would ‘love' to stylise on your own? Look no further, as Printcious has the solution for you! Enabling customers to reflect their own thoughts literally, we have an exclusive option for personalised gifts, which can be designed upon your choice. All you have to do is to choose from a wide array of ready-to-customise gifts and order the gifts from Printcious for your friends or family members or maybe that special someone. The personalised gifts range from the cool t-shirts for him and her up to the comfy ready-made cushion and many other adorable items. Let your gratitude reflect from your attitude as you prepare for any special moments with your loved ones. You may find an array of fabulous gifts birthday ideas, wedding gifts for the couple and even the best graduation gifts for your friends. In fact, you may find everything you need here with just a few clicks and we're ready to send them to anywhere in Malaysia. These beautiful moments require warm wishes and unconditional love along with unique gifts and pleasurable tokens from us which will make your moment even more heart-warming. Celebrate Mother's Day or Father's Day with the most acknowledged person of your life and let them know how much you value them with some extraordinary gifts from Printcious available in exciting offers and deals. Our memorable Mother's Day gifts will delight any mothers in the world and be sure to leave a good impression on your mother. But how about your father? Delight your father with the best Father's Day gifts only at Printcious. You can send the gifts to any parts of Malaysia and we assure you that our delivery is of the top-notch. Pamper your beloved ones on their special days with Printcious as we bring to your view our whole new range of gifts for special occasions. Every occasion requires special attention and with personalised gifts from the house of Printcious, you can rely on our exclusive and supreme quality gift items. The gift items can be personalised upon your choice or even better – you can create your own customised gift item with our superior quality online design tools. By creating your gift, you can add your own choice of colours, designs, artwork and creativity and we will make sure that you receive the gifts just the way you wanted for your dear ones – an exposition of innovativeness and delight. In fact, we also provide corporate gift printing service for your events. Get the gifts delivery in Malaysia and be amazed with our gifts selection.